don't get caught: Communicators: Your wish list when you work with experts? Communicators: Your wish list when you work with experts? If you've worked with enough experts--be they government leaders, corporate whizzes, policy wonks, sage scientists or rock-star physicians--you must have a wish list going, at least in your mind. Maybe you wish your know-it-all expert could say "I don't know" once in a while to boost her credibility. Or maybe you wish your expert wouldn't blow off media interviews. You might be working with the realization that your expert has a high need to be perfect and fears failure, which means he doesn't want to take chances he can't control. You might have an expert scientist on your hands who dismisses communications as unimportant, not an essential part of her research activities. Or maybe your wish list involves you: Perhaps you wish you, as a communicator, could do a better job figuring out the experts you're putting forward and what they need to succeed. How do you successfully handle big-ego experts, unwilling partners and dense language? And you're probably shuddering to think what reporters think of your balky experts, rightly so. If so, you and I have a lot in common. I've spent most of my career working with smart folks and convincing them to participate in public communications, media interviews, testimony before legislatures, funder talks and other public forays. 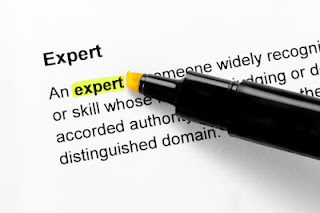 That's why I've created Be an Expert on Working with Experts, the workshop I wish I'd had at many points in my career. It's an intensive one-day session where you and other communicators can start creating solutions and new approaches to your work with experts, so you can be more effective at this important work--and it's based on my extensive experience working with experts of all kinds. You'll get a substantial discount if you register by May 25--just $300 for the session, which includes continental breakfast, lunch and takeaway materials you can use again and again. After May 25, registration rises to $350, and all registration closes June 10 for this June 19 session in Washington, DC. Registrations are already coming in, and some participants have been on a waiting list for this workshop, so it pays to act quickly. experts who are "unwilling to rehearse"
the "belief that their priority should be everyone else's priority regarding news coverage"
"Scientists frequently seem to misunderstand the literacy of the public or the value of the editorial/ communications process." "They seem to think everyone out there is a wonk with similar knowledge/interest/experience with their specialty." "They don't grasp the need to talk to an audience that might not immediately see a reason to care about their issue." "Confidence and overcoming what I consistently perceive as an age/experience barrier. While I'm in a senior position within my company I am years younger than many of my colleagues." "What is the best way to communicate the difference between 'dumbing down' and 'being accessible'?" "How to get past the expert's ego?" "How can I get them to listen to a communications expert?" "Any suggestions on how to deal with experts who think they are great interviews but are not?" "Any ideas on how to convince an expert that "messaging" is a good use of their valuable time?" "What are some techniques to encourage experts to think ahead for an interview instead of just diving in because they know their topic so well?" "How can I preserve the content of the science but present in a publicly accessible way and a way that is comfortable to the scientist speaker? Sometimes, they seem uncomfortable with a speech written for them or over scripted." "How to communicate with confidence? How to understand their vision without getting lost in the weeds? How to provide feedback that communicates collaboration rather than corrections?" What's on your wish list when you work with experts? If these questions and challenges sound familiar to you, share your wish list in the comments, then register and join us on June 19.